Get out your muddler for an amazing cocktail that fits perfectly into any patriotic-themed party. The flavor combination in the broad stripes and bright stars cocktail is both marvelous and surprising. It's a recipe created for Lucid Absinthe and definitely one of the more intriguing and pleasant ways to enjoy the somewhat notorious spirit. 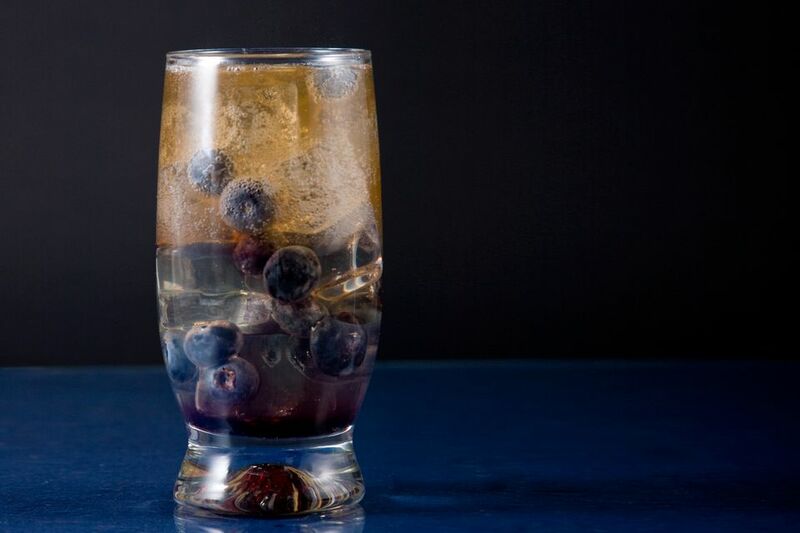 Blueberry is not a flavor that's often associated with anise, but here both the fresh fruit and a blueberry-flavored vodka are placed in perfect balance with absinthe. The ginger beer is the perfect finishing touch that gives the drink a great spicy snap. In order to complete the red, white, and blue theme, be sure to include the raspberry drizzle and sugar cube garnish. They're small, but fun additions that add to the experience. Muddle fresh blueberries, then add the syrup, absinthe, vodka, and lemon juice. Add ice and shake. Pour everything into a highball glass. Drizzle with the raspberry liqueur and top with ginger beer before garnishing with a sugar cube. Add as many blueberries as you like! You really cannot go overboard with the fresh berries. Just be sure to rinse the berries well before muddling them. For the blueberry vodka, you could choose either Van Gogh's Acai-Blueberry, which is deep bluish-purple, or a clear one like Stoli or Smirnoff. It depends on the color that you want for your drink. Chambord is the natural choice for the raspberry liqueur, though there are a few others that will work great as well. Bols, Di Amore, and Mathilde are readily available brands. It's also a popular flavor for smaller distilleries, so look for names like St. George Spirits (California), Okanagan Spirits (Canada), and Whidbey Island (Washington). Lucid is the recommended brand of absinthe and it's widely distributed throughout the U.S., but there are others available that will work in this cocktail. As a substitute, you can also use any anise-flavored liqueur, including anisette, Herbsaint, or Pernod. How Strong Is a Broad Stripes and Bright Stars Cocktail? Lucid is bottled at a hefty 124 proof, so it is one of the stronger absinthes (they range from 90 proof to 148 proof). At such a small pour, that really doesn't make a big impact in this cocktail, though. On average, you can expect this recipe to have an alcohol content in the 6 percent ABV (12 proof) range. It's one of the lightest absinthe drinks you'll find and not much different than drinking a beer.